The fire which plunged Manchester's phone lines into chaos was caused by electrics damaged during maintenance, BT has said. 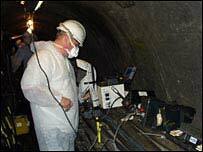 More than 130,000 lines were cut by the fire in a BT tunnel beneath Manchester city centre on 29 March. The communication breakdown cost businesses an estimated £4.5m a day and business customers will be able to claim up to £25,000 compensation. BT says it is not admitting any liability for the blaze. "BT believes that during the course of work being undertaken in the tunnel before the fire, electrical fittings were damaged and this damage may have caused the fire. Investigations are on going," said a spokeswoman. "We are sharing our investigation - we are not admitting liability. "Customers will be able to apply for compensation depending on their individual contract - we feel this is the right thing to do." The fire hit the ambulance service's communications, banks and businesses and thousands of people were unable to use their phones, faxes or send e-mails. BT is offering businesses and residential customers compensation according to their individual contracts. Residential customers will receive one month's line rental refund for up to three days loss of service and two months line rental for four to six days loss. Commercial customers could get up to £25,000 compensation if they can prove "actual loss".